Working in a company or running a business may require additional time. And for that, you need to sacrifice the hours that you must spend for your family. As you grow as an employee or a businessman, the needs of your life partner and children grows as well. Because of it, you become to think that working, while it is actually for your family, is not at all family-friendly. Though, that would not be the case if you start your own business at home. Running a home-based business is basically just the same as getting employed or managing a regular business. The difference is you are close to your kids and there are comforts that a regular occupation is not able to bring. Though, starting a home-based enterprise is not easy at the beginning. When you are at the early stages, cash flow is slow and your profits are limited. You are your own boss, nonetheless, so you have the option to stop or to continue. Since you chose the latter, let us move on to some helpful ideas to help you get started. First, do not believe in alluring promises you see online. Certainly, an entity that pops out, promising that you can earn as much as 8,000 Euros in just one month is too good to be true. Home-based entrepreneurs testify that these promises actually are. There are no quick fixes when it comes to earning such a huge amount, so judge accordingly. Second is research. Reading about the market on and off line will show you what exactly the consumers need. Manufacturing a product or offering a service that nobody needs will only lead to waste. Study your market before investing your capital. Conduct a feasibility study to determine whether a product or a service has a stable market. For example, a product and a service that does not go out of being needed is food. Use the power of the internet and social media to make the public aware about your food business. Third, consider your capital. Your financial capability will determine the magnitude of your home-based business. In line with this, think about where you would get your fund. It may be from your savings or your job separation pay. You can augment your resources by availing loans. Just inquire to your preferred insurance company or your bank if you consider this option to increase your resources. When you have everything taken into consideration, like you have finally decided on a company name, proceed on making your business legitimate. For this step, you may ask a lawyer or your local government offices for the proper procedures. One essential step on building up a business is visiting the website of Companies Registration Office. From there you can download the application form. After completing the form, mail it to their postal address; the information is included in their website as well. Take advantage of the free business mentoring programs that the Irish government provides. This way, you can sustain your home-based business, or better yet, make it more successful. As you see, working and earning should not take you away from your family. Busy Lizzie provides businesses and individuals with the time they need to focus on other tasks. We have a variety of services available to make the lives of our customers easier at an affordable price. Our office is staffed with experts that range from secretarial and administrative to experienced marketing and sales professionals. Clear the Cobwebs and Make Room for Christmas Cheer! In a few weeks time, the whole world will soon be celebrating Christmas again. Basically, this occasion is commonly fun- filled and an experience with a merry Christmas with people dear to you is something great to cherish for the rest of your life. And since we are still some few months away, we still have time to prepare – prepare everything in the house from Christmas decorations, Christmas cards, and anything that entails Christmas. How about the most important thing to prepare – yourself? There are so many times that we may not feel at the best parts of ourselves. There are times too that we may not feel to be at our brightest. During those times, it is very important to treat them as your best opportunity to reflect and ponder on the things that you have had during the past few months or days of your life. Pondering will help us think of the best ways to let the inner light within us to shine to the fullest. Basically, if you are someone who is really interested to clear the cobwebs and make room for Christmas cheer, you will come to the point of knowing the right way on to do the clearing process. This also applies in the workplace where you need to keep everything organised. Sorting things out and clearing what needs to be cleaned the working environment are important factors that every employee needs to practice. Accomplishing all the tasks before getting a vacation will surely give your peace of mind during your being away from the workplace. In any workplace, there are tons of tasks to do and often, the amount of work cannot be accomplished within the expected time given. The concept of Virtual PA in any company can minimise the amount of work that needs to be done within the day. If hiring such personnel is time-consuming, then acquiring the services of the experts is the best thing to do. At busylizzie.ie, you can enhance the quality of your life by making a balance with work and family life. Since Christmas is one of the most celebrated occasions every year in the whole world, clearing out your workload in order to spend time for the holiday is the best way to enjoy the season. It is but normal to encounter tonnes of work before the holidays. Yet, it is still required to accomplish all these in order to have a peaceful Christmas vacation. It is fine to go through that pressure of finishing all the work rather than spending the holiday with a lot of pending work to go back to. Having a fresh start after the holidays gives you more motivation to employ your daily tasks. So, to make yourselves prepared for the upcoming Christmas, you have to be prepared to undergo pressure and have the work done at the right time. You will finally realise why it pays to the Cobwebs and make room for Christmas cheer. When it comes to the different types of employees that exist in this world, it is not surprising to take note that there are actually only two types of them – those who are well-organised because they simply crave for such characteristics and structures, and those employees who simply love working or living in the world of the disorganised. But it is however amazing to note here that even disorganised people still has the ways to find what they are looking for no matter how chaotic their situations seem to be. Seeing these people who way makes you think that they simply follow a “system” which can only be understood by them alone. Successful organisation is generally defined as spending the smallest or lease amount of time that is required to come up with the most organisation to perform the job quickly and more efficiently. Organisation in the workplace is a matter of proper task delegation to the appropriate manpower. Problems occur in the absence of organisation. Hence, if this factor is missing then the operation seems to be chaotic that even employee personal issues would come in. An organised structure can be handled well by busylizzie.ie. The presence of back support office can promote an organised working environment. It takes a longer period of time (seems like forever) for an employee to remember the things you have asked him. They are usually late when attending meetings at the office and they usually fail to present a report or information once they are already there. Easily gets frustrated with small things within the workplace. If these signs are evident to your employee then there should be immediate things that should be done to help them. Also included are some useful tips and guidelines to help you maintain a good and conducive working environment for you and your employees as well. Let your employees know how well you really like working in an organised workplace. Let them know the kind of “system” you wish to establish inside the workplace; this will make them adjust their selves of your so-called systems from theirs. Managers should be given the tips and pointers on how to relay things concerning to the workplace structures to the employees. Let the employees know when and where important papers should be documented and stored. Tell them when do you want your mails. Tell them of small details you want; for example, is if preferable for you to have simple emails or have those messages and documents printed. Everyone in the office should also inform you the locations of the important things needed in the workplace no matter how big or small they are. Being an employer, you should help your employee the ways on how they can identify the organisation structures or systems of their friends. Set up an organisation structure which may prove essential for employees to follow. Everybody in the office may his/her own organisation process but you have to understand that setting up and enforcing processes and procedures will greatly improve an organisation as everyone in the workplace will be following one basic organisation structure. Although manpower may be complete, the presence of Virtual PA can enable quality work with less expense. Outsourcing throughout Ireland for virtual personal assistant and back office support positions can be done by the experts. Let busylizzie.ie get into your office and spell what proper organisation is all about. Steamy situations happen not only in literally hot places but figuratively in places where stress is on a high level. The workplace is a common place where the temperature is high due to stressful work load and demanding superiors. This kind of situation creates pressure in the workplace making every employee work under difficult conditions. With this, every individual in the workplace must know how to deal with such amount of pressure. Thus, the concept of cooling oneself under steamy situations must come in. Times of stress usually occur when you are put in a situation wherein your workplace comes with lots of problems; no matter how small or big these problems, it will be very important to consider yourself to be cool at all times as this will help you put everything in the right place. To keep your cool, take a deep breath and you should exude patience and understanding; simply combine these two characteristics and you will be able to control the situations particularly when you need to fix a heated situation or problem inside your workplace. This is how it works: in terms of literal situations where the human body responds to a high-temperature environment. On a deeper context such situations can happen in many ways. Say for example, the presence of such situation in the workplace. Oftentimes, the office is a place where pressure is on a high level due to administrator’s demands and regulations. Having this is a common scenario, it is essential that you have to keep yourself cool in this situation by promoting a clear mind set in employing your job. One of the most important things that you have to learn is to keep up with what needs to be prioritised. It is but normal to encounter a heavy work load and with the proper organisation of carrying out the task, then all these can be accomplished within the expected time. If you are running an office with less manpower and too much work load, the presence of Virtual PAs can help minimise the workload with less expense. These individuals need not be physically present to employ the job, but they can perform tasks in a home-based structure. Most of their jobs are computer based and all the systems follow a systematic online procedure. By acquiring the services of busylizzie.ie, a back office support company, you are assured that your office will be in proper order and outsourcing for manpower will no longer be a problem as this comes with trusted and reliable delegation that helps in outsourcing in Ireland and other places around the globe. Working from Home and How to Stay Sane! There are many benefits to telecommuting or working from home. This is different from having a home business that you run, in that you don’t need to be concerned with marketing, sales, staff, etc. If you are an employee of a business that has work from home options and provides you with the equipment and software you need, there are still important considerations for both your work and your family/home life so you can avoid the common pitfalls of working at home. Whether you are sewing, doing data input, making phone calls, or preparing corporate taxes, it is essential that you are able to work without distractions and concentrate on what you are doing. Make sure your family, particularly if you have young children, understand that whatever area you have designated as your work space is unavailable during your working hours. It is essential that everyone in the household understands and respects your goals. Also, helpful is having a regular schedule of “business” hours so that everyone becomes accustomed to the schedule. As important as being left alone to work is, it is equally important to stay in touch with the outside world and your colleagues. Many options are available to you quite easily. Communicating online literally opens up the world to you via Internet connection. Always make sure you are available by either home phone, business line, or mobile phone. Depending on your schedule, set up weekly or monthly online or in-person meetings to make sure you are keeping up to date in your industry. This will also encourage you, as lack of motivation is a frequent obstacle for telecommuters. Working from home is not the same as being at home. Try to avoid volunteering your time or scheduling family appointments during your work hours, or your life will become cluttered and chaotic with no definitive line between work and personal time. Most workers who are also parents of young children have come to realize that an at-home-office does not save money for child care costs. It is difficult to care for children while fulfilling job obligations. Remember, an at-home based job deserves the same attention and obligation as an in-office position does. I am not a fan of paper, never have been. For me it has always been computers, and now a lot of people have cottoned onto the fact that lots of paper means money, lost space and environmental impacts. Busy Lizzie works with a lot of medical consultants, GPs and solicitors and as you can imagine they use a lot of paper, or so I used to think. 6 years ago I worked with a consultant that had just come back from working in the UK. Before I worked with him, I had never seen a paper free medical office. All faxes, letters and communications were scanned onto the patients profile, all dictations was digital and transcribed (letters were printed, but a lot were emailed) and back ups were taken each night. Now setting something like this up does take time and money, but you have to think of the long-term outcomes. There was more room in the suite, to take on more consultants, brining in more money. 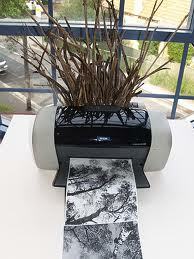 Printing costs were very low, and the cartridges were also refilled, again saving money and the planet. What small changes can you make in your office? We want to know how YOU strive for balance in your work and life. You have more meetings than hours in the day, a presentation to plan, your staff is putting in for holidays, the school is calling for you to pick up your sick child…sound familiar? Life is stressful and rarely ever predictable, so what’s a person to do? What are your best hints and advice for not only coping, but successful and happy? We are putting together a list of all work:life balance ideas and will send it out in 2 weeks time. If you’re a multi-tasking parent, you might want to consider this. Are you really hearing what your child is telling you if you are switching back and forth from listening to him and also cooking dinner and checking your email at the same time? Our brains are not set up to wholly concentrate on more than one thing at a time. Perhaps instead of “multitasking” you are “switchtasking” (Crenshaw, The Myth of Multitasking). Schedule better so that you are not needing to layer tasks, and set your priorities so at any given moment you are truly concentrating on what’s most important. 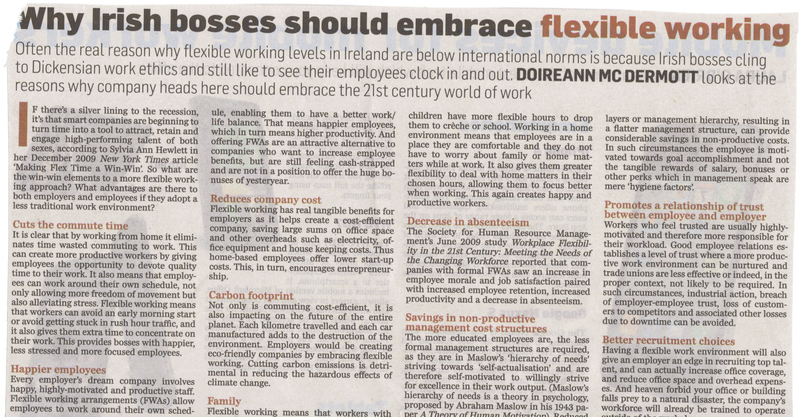 Another great article from Irish Independent on 24.03.2011, which endorses all the reasons why Busy Lizzie is here today.